Hi. I’m Eric Shoemaker. I created and manage 1967beetle.com. Amanda Shoemaker helps with programming, photography, and writing. Timm Eubanks is a contributing SoCal photographer, along with Jay Salser who’s a huge influence on the ’67 Beetle community. Many other great folks around the world contribute their ’67 restoration stories. 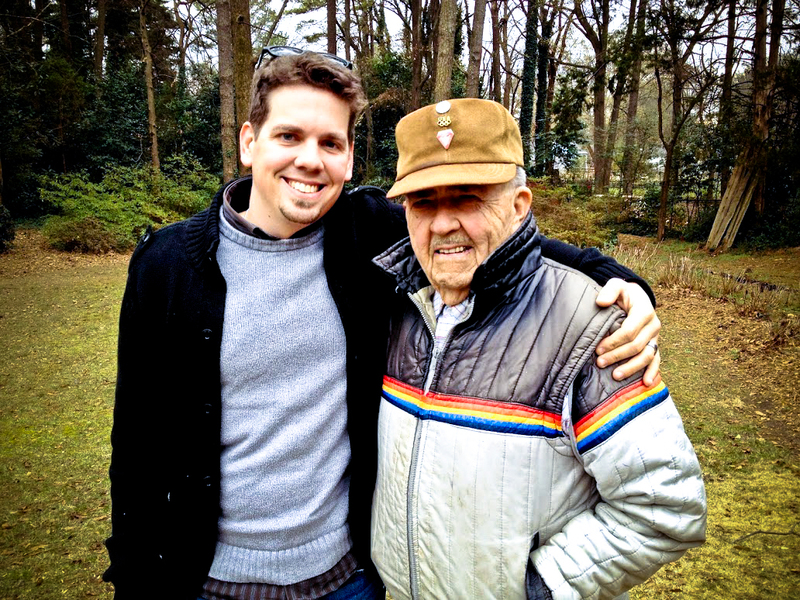 The photo above is of me and my grandfather. He gave me the ’67 and purchased it new. I love him dearly, and my restoration efforts reflect the passion I have for these old cars, which has now grown into a business. 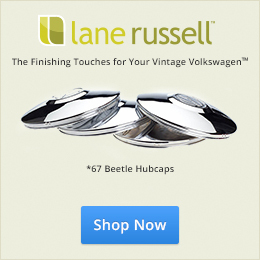 Here’s a bit of background on myself and 1967beetle.com. How long have you been into vintage Volkswagens? When did it become an obsession? About 9 years. To get a better idea of the infant stages, read my ’67 restoration story. I can’t say it’s an “obsession.” Ok, it might be… My good friend Timm and I call it the “VW sickness.” It’s just something I’ve become very passionate about. I’ve worked as a visual designer / art director for the last 11 years. Over the last 9, I’ve been working on my ’67. During that time, I fell in love with creating real tangible objects and working with my hands. I’m obsessed with small details and the idea of bringing something old back to its former glory. I’m even offering restoration services on a few one year only parts for the ’67 Volkswagen Beetle. You established the #vintageVW hashtag on Twitter. How does the online community matter to the Volkswagen community as a whole? The #VintageVW hashtag seemed like a good (fun) idea to tag content on a social level. It’s grown organically. Little by little, more people are starting to use it who are sharing vintage Volkswagen related content. I’ve even seen it on Instagram. It just happened. As I might have mentioned in the history article, my grandfather purchased the ’67 new. I have fond memories of riding around with him as a child. When I first got the car, I had no intentions of doing a restoration. The interest and passion came out of pure necessity to keep the car on the road. Bobby at Advanced VW in Decatur, GA rebuilt the engine. After that, I’ve tried to learn as much as possible myself. Little by little, it became somewhat clear that I’m actually pretty good with my hands. The connection between visual design and restoration is there for sure. For any issues I can’t handle, Sean and the good folks at The Buggy House are always there to help. Ron Bengry and I have also become a good friends. He’s a fantastic resource for ’67 parts knowledge over the years. I take a lot of pride in knowing that my grandfather’s old Volkswagen was very close to being sent to a junkyard, and I saved it with my own two hands. You seem to have lucked out in owning what many think is the best year for a VW Beetle. We all agree about what makes VWs great, but name one thing you wish the VW designers had designed differently? So, you have the ’67 and are known for that. Any plans for another vintage Volkswagen anytime soon? My wife, Amanda, and I often joke about the idea of a bus. Currently, I have more than enough to keep me busy with the ’67. We’ll see. What would you like to accomplish with your website and Volkswagen communication in the next year? I’d love 1967beetle.com to become a true resource for people who are aiming to do a stock restoration on a ’67 Beetle. I’m a firm believer that the continuation of great content can achieve this. The bigger idea behind the site is to connect ’67 Beetle owners globally. Most importantly, I’d love to find a way to combine my visual design, marketing, and vintage Volkswagen restoration skills into something full-time as our business grows. I plan to continue featuring other ’67 restoration stories and grow tips and tutorials. Lane Russell is family-owned business located in Decatur, Georgia and operated by us! — Eric and Amanda Shoemaker. We have a background in visual design, photography, and technology… and a passion (some call it an obsession) for the vintage Volkswagen. We offer only the highest quality products available — including OEM, German, and NOS, with a focus on unique accessories. Please let us know if there is anything we can do to help you complete your restoration! I am very glad your Grandpa didn’t give you a Volvo or Jeep or I wouldn’t have met a great addition to the VW world! Write on! I think tour Grandfather would be proud of you keeping and restoring this car. He must have loved it or why would he have bought it in the first place. I’m glad,like Timm implied, there would be no 1967beetle.com. Great site! My son and I, for years now, have talked about a VW cable TV show. It could be like “Muscle Cars”, “Trucks” or “Overhaulin” and show restoration procedures such as you have done that people could accomplish on their own. With editing, you could show quite a bit in a half-hour show. We’ve always thought it would be a hit, what with all of us with the “VW sickness” out there..
Ha. I have the sickness too. You’re in good company. have one. Be nice to see how many ’67’s are still out there on the road. I do not know whether or not Scott still works with this Site. Try it, though. Otherwise–I bet that Donna Fischer (a constant Reader of 1967beetle.com) will contact you through this Forum. She is compiling a very nice “registry/record”.